I'm in love. Seriously. 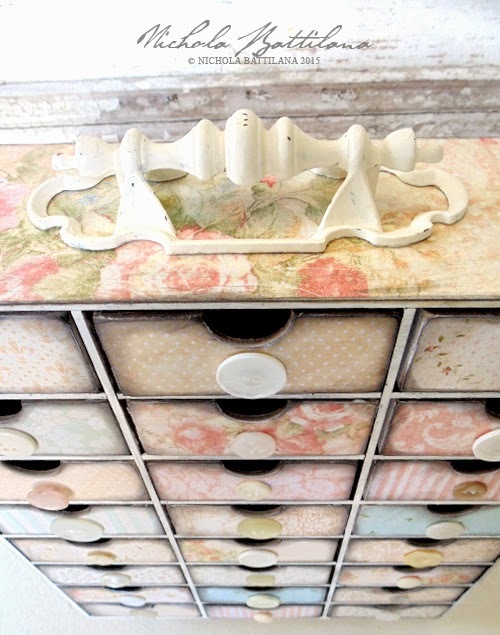 Just look at these little drawers! 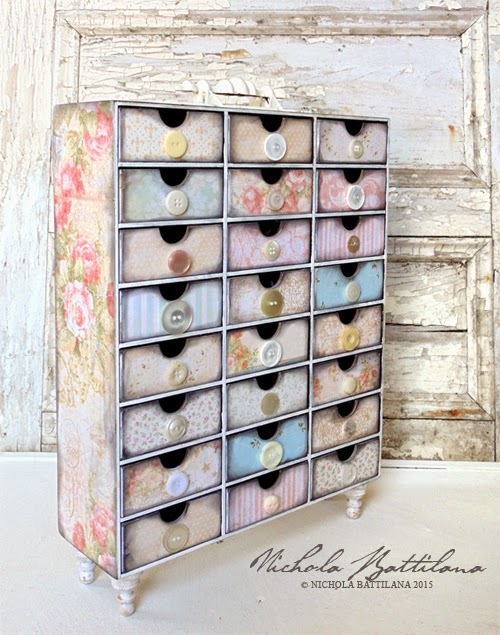 As soon as I saw this set of 24 drawers from Gina's Designs I knew I wanted to make them mine. Now, doing anything 24 times can be a bit of a pill. About 3/4 of the way though assembling all those boxes I thought "What have I gotten myself into?!" but I prevailed and I LOVE the results. 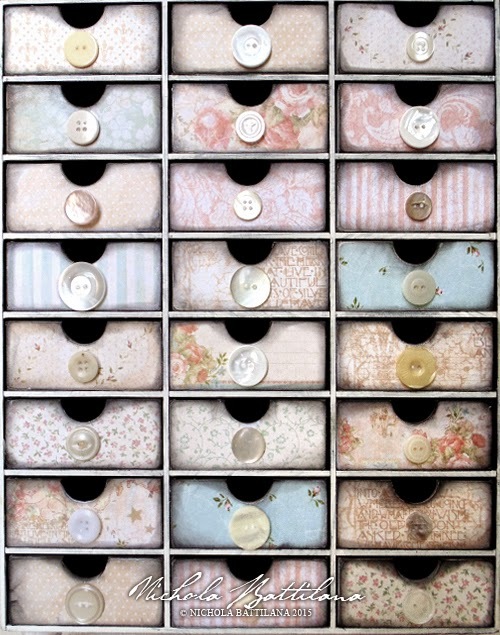 I've embellished mine with papers from the Baby 2 Bride—Deluxe Collector's Edition and added vintage buttons to the front of those drawers. Yes, yes... the insides are unfinished. Let's just pretend they're lined with music sheets... which they will be... one day.... maybe. One of my very favourite things about these drawers is that if you aren't keen on the little finger pull cut out crescent, there is a small hole on the other side for adding knobs and handles. Either way, if you slip your drawer back in the wrong way (not that ever happens to me *cough cough*) you can easily pull it back out. They're a nice size too at 3.5" x 3.5" x 1.5". I have a pair of these vintage metal handles I've topped my drawers with. Now that there's only one left, I guess I'll just have to make a second set. Last little bit to finish it off, some chess pawns painted white and added as dainty feet. Yep. 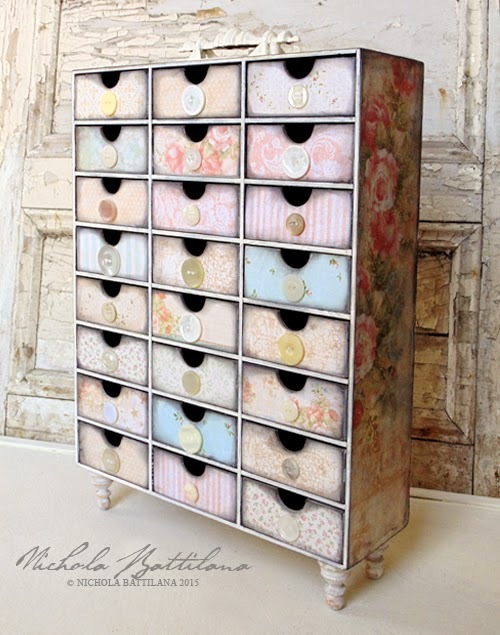 Pretty pleased with the shabby thing and I can't wait to fill those drawers with all sorts of magic. So incredibly gorgeous!! Well done!! 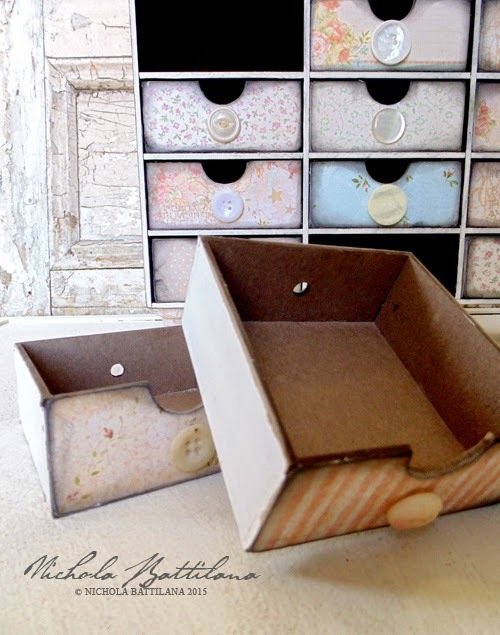 Love the wee drawers! You really did a fantastic job! That is just lovely Nichola, I can just imagine all the wee treasures you will be storing in there! Love love how you decorated these!! Wish I had room in my studio- ah heck, might have to make room! !